Since the early 70s, the concept of self-help in housing has become a strong theoretical foundation as well as a practical and functional basis for public interventions in upgrading slum areas. However, its definition has led to different interpretations. In general, self-help practices withdrew the notion of ‘user control’ over construction process, which led to their failure in achieving the concept’s original objective: allowing integrated community participation and the creation of autonomy in housing environments. A set of practical questions about the self-help approach still remains unanswered. What is the user’s role and responsibilities? In which phases of the housing project does he participate? What is the role of the expert and the state? This documentary addresses these fundamental questions by referring to the informal housing production modes in Cairo, capital of Egypt, and one of the most dense cities in the world. Its informal development has been and continues to be the dominant mode of urbanization, housing over 9.5 million inhabitants. In this testimony, two families of self-builders living in Cairo’s informal settlements describe the process by which they built their homes and show the practical elements of self-help and challenges of housing autonomy. In fact, they demonstrate that drivers actors, processes and social systems are implied in the project management, they influence each other and their combinations include a variety of participation processes. Three principles of housing autonomy emerge from this informal self-managed construction process. First, participation in housing implies user control over the entire project. The beneficiary must have a significant decision-making power over design, planning, financing, and management of the project. The autonomy that the informal owner-builder benefits from exists and prevails due to his capacity to articulate different essential resources such as land, local construction materials, financial and human capital, expertise and building tools. Second, housing must be seen as a process rather than a product. Its values lie in the relationship and inter-action between the actors, their activities and the produced house. In the informal sector, the organizational design, that implies the user’s coordination between these three elements, is allowed by the existence of a decentralized market of housing components and resources. The informal housing market has a large network of independent actors and suppliers that offer a necessary variety of construction means. This multiplicity of choice creates the opportunity for the user to combine different options and responds to his specific needs through collective arrangements. The role of social networks and know-how transfer is also important in strengthening individual capacities and diversifies the user’s lines of action. These networks allow a freedom of action and choice, which is fundamental to an autonomous housing system. In addition, the informal housing financing modes are essential. As we question their role and the ways in which they benefit the development of the economy, we note that they are the ones financing the small and medium sized enterprises and the micro enterprise, particularly in the construction sector. Third, a self-help housing strategy implies a change of the role of planners, architects and the state. The application of user control to the assembly of the housing components; the design; the construction; and the project management, means a greater dependence on the user’s capacity to negotiate land prices and localize the process of acquiring and transferring property rights, accessing tools and materials, financial resources, and architectural expertise. These resources are a function of law and its administration, which are controlled by the central authority. The user driven approach to housing isn’t a combination of the formal and the informal, but rather a combination between two inter-linked and open systems in which the state and professionals assist the people’s activities in planning, designing, building and managing housing projects. This co-responsible model demonstrates that the housing production environment has a complex role in identity formation and determines the strengthening, (or inversely), the weakening of the community’s capacity to participate in managing the housing construction process. 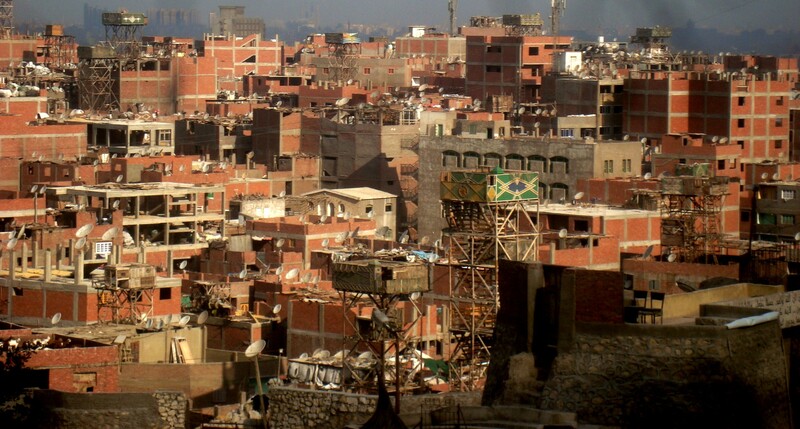 It is by these characteristics of its structure of authority and control that the informal modes of housing in Cairo create a resilient and user-generated city. These processes identify the emergent tendencies of developing countries, which define the global conditions of contemporary urbanization. This reality calls upon a dramatic change in the approach to the phenomenon. Overcoming its legalistic approach and understanding the organizational potential to promote it, requires a shift from a top-down planning system to a heterogeneous system of multiple networks in the construction sector, which includes actors, artisans, entrepreneurs, technologies, and financial mechanisms. Housing should be thought of in its integral complexity, by identifying and prioritizing its interdependent tendencies and avoiding a sectoral approach, which mostly ignores and fragments them. Iman Salama is an urban planner from Egypt currently working at Urbamonde in Geneva on the construction of the social fabric in cities such as Cairo and Mumbai. She is initiating a PhD research looking at the role of local contractors and entrepreneurs in the popular housing and neighbourhood production processes in Cairo, while experimenting with new approaches to engage with and assist local dynamics.